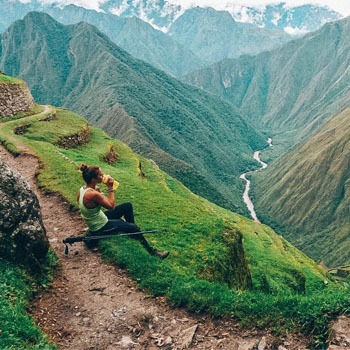 *2018 Updated Information* Rainbow Mountain Peru is fast becoming one of the most popular treks in Peru. 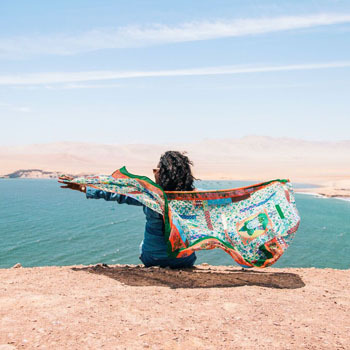 Keep reading to learn about the experience I had at Rainbow Mountain Peru and learn what to expect. 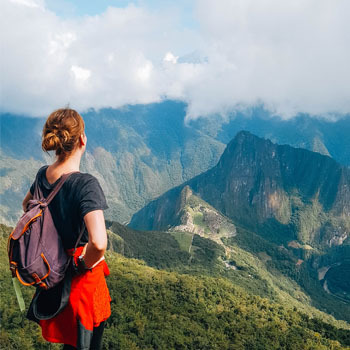 The trek can be difficult, but Rainbow Mountain Peru is a wonderful place that can be enjoyed by anyone and everyone with the right preparation and planning. 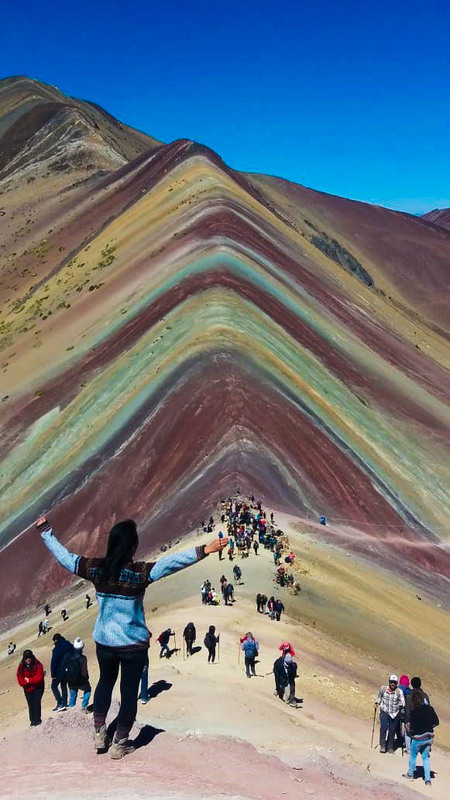 If you haven’t already seen the pictures making the rounds on instagram and other social media networks, Rainbow Mountain Peru is a unique mountain formation in the Andes of Peru which features all the different colors of the rainbow, an extraordinary and amazing sight which shouldn’t be missed on any trip to Peru. The unique appearance of Rainbow Mountain Peru is due to volcanic activity in the region which creates individual layers rich in specific minerals and corresponding to particular time periods. Tectonic activity is slowly pushing the earth up and revealing the spectacular red, orange, yellow, green, blue, indigo and violet hues underneath. 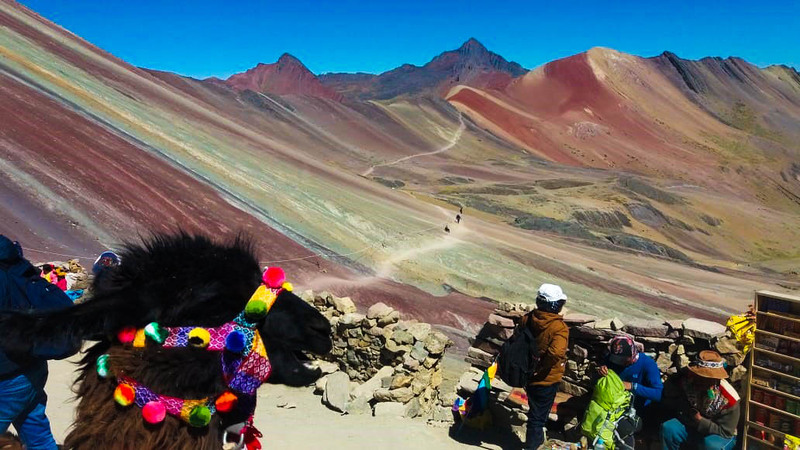 Known as Vinicunca to locals, Rainbow Mountain Peru is notoriously difficult to reach, but has become somewhat more accessible in recent years due to glaciers receding which has allowed easier access. 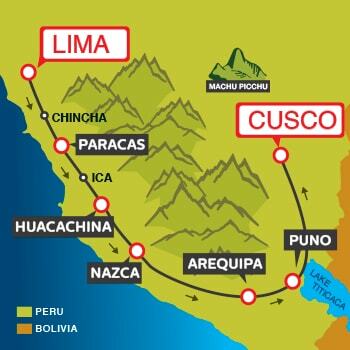 The trailhead is reached by a 3-hour drive from the city of Cusco. From here, it’s a 3-4 trek through somewhat difficult and muddy terrain. 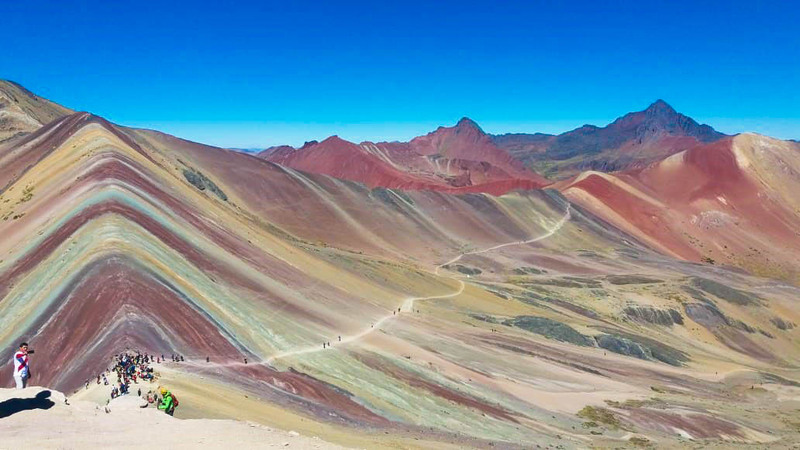 The altitude can also complicate things: Rainbow Mountain Peru reaches a height of over 15,000 feet above sea level. That’s almost half the height of Mount Everest and several thousand feet above the level at which altitude sickness can take effect, if you’re counting. Symptoms of altitude sickness can include fatigue, headache, nausea, rapid heart rate and more. I took Rainbow Mountain Travels which is equipped with an oxygen tank on every tour, and I was glad I did because my companion ended up needing to use it. Not all tour companies bring an oxygen tank, so make sure you do your research and book with a safe option like I did. Anyway, despite the somewhat difficult nature of the trek, it was 100% worth the effort to get there. Rainbow Mountain Peru is an absolutely incredible place, a place that defies description. I took some of the most amazing pictures of my whole journey on my hike there. I definitely recommend a visit to Rainbow Mountain Peru for anyone who will be in Cusco (or even if you don’t have plans already, you should make them!). Here’s a look at what the itinerary is like. 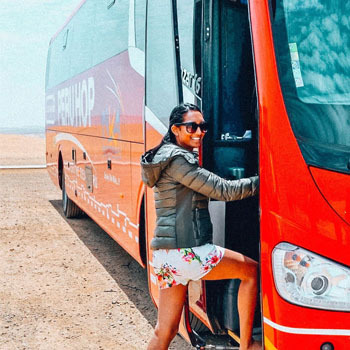 Tours start early, usually picking you up at your hostel or hotel at around 3:00 am. I definitely recommend getting a tour as early as possible, that way you’ll arrive at Rainbow Mountain Peru before all the crowds get there and you’ll be able to take the best pictures. 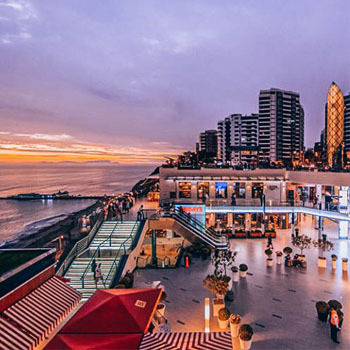 Check out the Tour Operators section of the official Rainbow Mountain Peru page for some good information on choosing a company. The 3-hour drive to the start of the trailhead will be a bit bumpy, but try to get some sleep since you’ll have a long day of hiking ahead of you. Temperatures will continue to drop as you climb to higher altitudes. Make sure you come fully equipped with cold-weather clothes such as a hat, scarf, and coat. Check out the What to Bring section of the official Rainbow Mountain Peru page for some advice on preparation. If you have problem with the altitude, I recommend trying the traditional local cure for altitude sickness: chewing coca leaves. Normally you’ll gather with your group and have a small breakfast before setting off in search of the “rainbow.” It’s not recommendable to eat too much, since food takes longer to digest at high altitudes. After you arrive to the trailhead, you’ll have to pay a small 10 soles (about $3) fee for entrance to the trail. This is not normally included in the price of your ticket, since this fee goes directly to the community which maintains the trail. The trek will take approximately 3-4 hours and you’ll notice the colors and climate gradually changing as you make your way down the trail. If you don’t want to do the trek on foot, you’ll have the option to rent a horse which will take you through the flatter sections of the trail (the horse is guided by its owners). Horses cannot make the final ascent though, so you’ll have to finish the final stretch on your own. Cost is about 20-30 soles ($6-9). 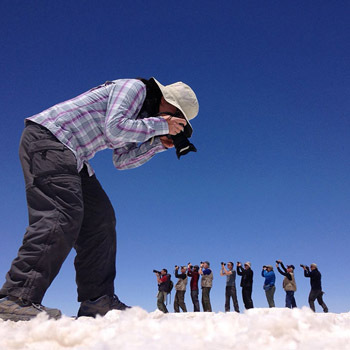 Once you arrive to Cerro Vinicunca, the main rainbow-colored peak, you’ll have plenty of time to take photos. Not only is the rainbow-colored mountain itself beautiful, but from this point you can also see the glacier-capped mountain of Ausangate, the highest mountain of the region which is sacred to local people. Make sure you bring your camera! After you descend, you’ll have a quick lunch before boarding your tour van to head back to Cusco. 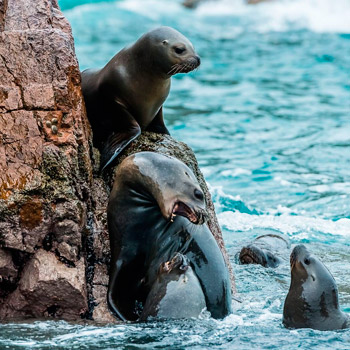 You’ll arrive back to your hostel or hotel in Cusco at around 7 pm. 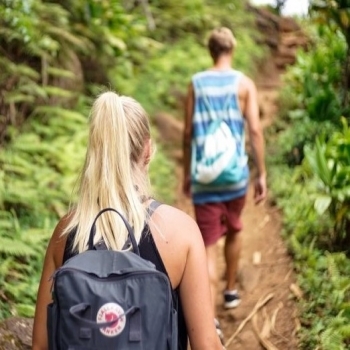 As you can see, the trek takes a little bit of work but it’s not too difficult as long as you make sure to prepare properly and book with a quality tour operator. 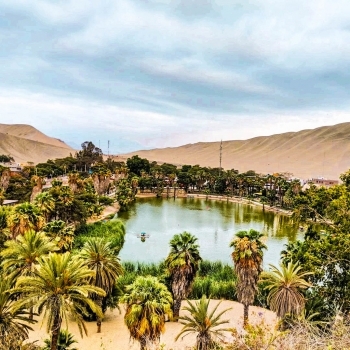 Make sure to check out the comprehensive information available here at the official Rainbow Mountain Peru page to help you prepare for this once-in-a-lifetime trek!